Over the past few weeks, President Donald Trump has repeatedly taken to Twitter to lament “Spygate,” his name for the unsubstantiated claim that the Obama Justice Department sent an undercover informant into the Trump campaign in an effort to sink his bid for president. As the so-called “Spygate” conspiracy simmers in the public debate, a fresh take on the matter boiled over on cable news earlier this week and eventually made its way to the president’s Twitter feed, too. Trump’s tweet appeared within hours of a segment on Lou Dobbs’ Fox Business Network program that highlighted text messages between Lisa Page – then an FBI lawyer – and Peter Strzok – a senior counterintelligence agent with years of experience investigating Russian espionage. Dobbs’ segment honed in on one exchange in particular that featured a phrase – “oconus lures” – that has since been subjected to rigorous speculation and debate. “You get all our oconus lures approved? ;),” Strzok asked Page in the December 2015 text message. “They're going outside of the U.S. to conduct a lure to bring them together with somebody in the hopes of gathering information about whatever case they're working on,” Gomez said. Nowhere in the texts is Russia, Trump, or the Trump campaign mentioned. “It's always possible that it could have related to something that is completely unrelated to the e-mail and the Russian investigation, Trump investigation,” Gomez said. The Strzok-Page texts referred to in Dobbs’ segment were released by the Senate Homeland Security Committee in February. After reports surfaced that Strzok was axed from Mueller's team for sending potentially anti-Trump messages, lawmakers demanded to see the messages for themselves. The texts were among a large cache of messages handed over to House and Senate committees. 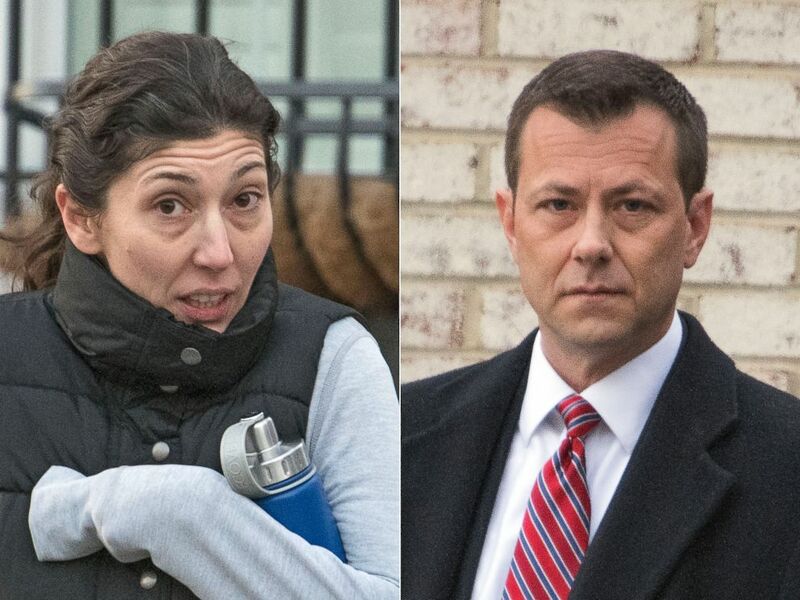 Department of Justice attorney Lisa Page and FBI Agent Peter Strzok, in Jan. 2018. Trump pounced on Dobbs’ suggestion that the exchange referred to an informant planted by the FBI into Trump’s campaign as early as December of 2015 – well before the previously understood timeframe of the FBI’s deployment of the informant. Before appearing on the most powerful Twitter account in the world, the “ocunus lures” conspiracy traversed a Reddit thread, a fringe conservative outlet, and eventually made its way onto Fox News, where the president is known to grab headlines and tweet them out. The progression of this particular conspiracy theory – from the depths of Reddit to President Trump’s Twitter feed – highlights a recurring tactic Trump has employed since taking office: Embracing an unsubstantiated claim suggested by an outside source, peppering it with innuendo, and tweeting it into the ether for his followers to debate. This particular incident’s genesis appears within the depths of a Reddit thread for conspiracy theories, first appearing on the site on June 4. From there, conservative media outlet Gateway Pundit picked it up. By Tuesday night, the theory made its way to Fox News’ Lou Dobbs. “The word lures – which the FBI originally had redacted – refers to FBI recruited spies,” Dobbs said on his show. Dobbs’ guest during the segment, Chris Farrell, Director of Investigations at conservative watchdog Judicial Watch, asserted that the text exchange was evidence of the FBI planting a spy within the Trump campaign. Reached by ABC News on Wednesday, Farrell refused to elaborate. Last month, at a controversial briefing for a small group of high-ranking lawmakers on both sides of the aisle, the Department of Justice revealed documents related to the use of an informant hired by the FBI to touch base with campaign officials suspected of speaking to Russians. In the days since the hearing, two prominent Republicans who attended – House Speaker Paul Ryan and Rep. Trey Gowdy – have defended the FBI’s conduct with regard to the informant.